Wildside Australia regularly provides educational, informative and entertaining workshops. Our aim is to inspire and educate not only professionals but everyday people to conserve our Wildside Australia. Workshops are run on a regular basis by our expert team in conjunction with our associated sponsors. Workshops are tailor suited to your needs and geographical location and topical of all things ecological including bush regeneration, conservation land management, wildlife and also film and photography. Wildside Australia's presenters are excited to speak at your next event, please enquire within and keep checking back to see the range of both free and inexpensive workshops which we regularly run. Brendy will be travelling to the NSW South Coast this September to deliver a workshop focussed on the rehabilitation of habitat for native wildlife. Brendy has over 13 years experience in conserving and restoring habitat for wildlife. 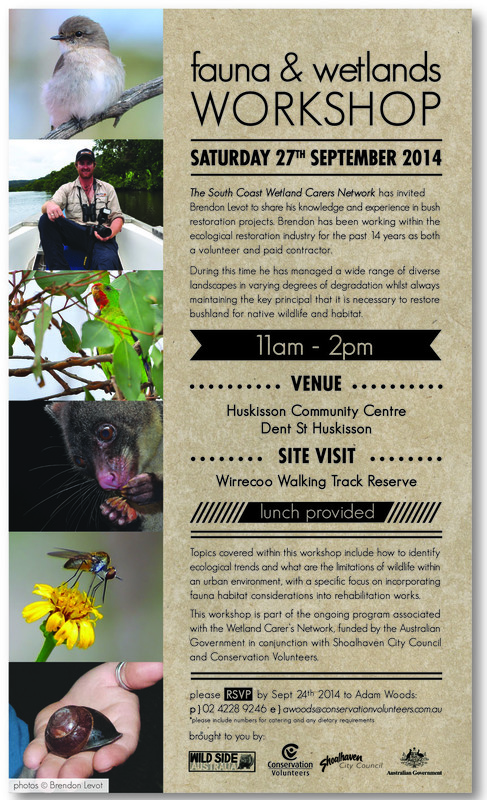 Come along to this FREE event hosted by Conservation Volunteers Australia and Shoalhaven City Council. (see flyer).